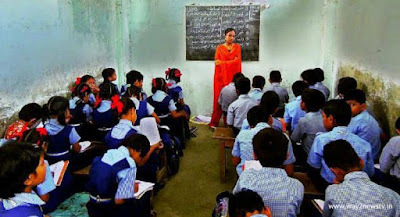 The primary school education in the rural areas is in the form of elementary education and the teacher is giving life. Primary education is becoming disorder with the lack of teachers in public schools. In that school, The only teacher who has five classes is difficult to teach. But he has innovative thinking. The lesson teaches five classes with the help of mobile phone. He is a classroom while Teaching, for rest of students by downloading videos from YouTube via phone and connecting sound boxes to a number of classes. YouTube From the Telugu alphabet, the qualities, the poems and the English alphabet numbers to download the charts and teach them the lessons to understand the students. Alladurgam The primary school in Gadipeddapur Tanda (Manikyaratanda) is running a private school. downloading from online attaching a small sound box to a cellphone the teacher is teaching the Classes. One teacher has been taught to teach five classes. The school teacher, Chitti Babu, got this idea. Smaller by Bluetooth to phone Soundbox is set up. As far as it is written, students are listening to it. The teacher is an innovative experimentation by listening and writing Successful. Education in the state is not visible in any public school. Compositions, removals, attributes, US letters, make up to 500 of various types of chats Did. and rhyms poems are readily available to students. The stories of dolls students English words and cockers are listening to the phone.